When you say ‘Sierra Nevada‘, I tend to get a little excited. When you say ‘collaboration brew’, I tend to get very excited so imagine my child-like delight to discover Ovila Quad, a collaboration between Sierra Nevada and the monks at the Abbey of New Clairvaux. Ok, really, it’s the heart & soul of Ken Grossman who built a small brewery in California in 1979 with the goal of producing exceptional ales and lagers. Against a back drop of home brewing, chemistry and physics on 15th November 1980 Ken Grossman brewed his first batch of beer. This would then become Sierra Nevada Pale Ale – a beer I personally love and I am yet to meet anyone who has tried it and not enjoyed it. Today I am always keeping an eye out for their limited release brews, the result of the Sierra Nevada Beer Camp and anything else they might be up to. The Ovila Project sees Sierra Nevada closely following monastic brewing traditions dating back centuries by the monks of Abbey of New Clairaux. According to the website there are 3 beers that will be produced, all limited releases and bottled in cage and cork 750ml bottles. However, we had the Quad (not the Spiced that’s due for release later in the year) so how many they are brewing over how long, I’m not entirely sure. Ovila Quad presents beautifully in the glass and, perhaps because I had been looking forward to opening the bottle for weeks (I was waiting for a slab of stinky blue cheese and a night when I didn’t have to work the next day!) it didn’t smack me in the face when I had the first sip. That’s not to say it’s lacking flavour, it’s just that I was expecting a Hulk-type assault on my senses (sorry, just saw ‘The Avengers’ last night). There are wonderful dark fruits and warmed raisins and spice flavours. There’s also that definite booze sweetness coming through the 10.4% abv in a very pleasant way, all in a medium bodied, well balanced Belgian-inspired ale. We paired it with Blue Cow Blue Cheese and it has to be said that matching beer and cheese is simply divine. When I co-hosted food & beer events at Five Bar I used to enjoy the cheese matching the most. 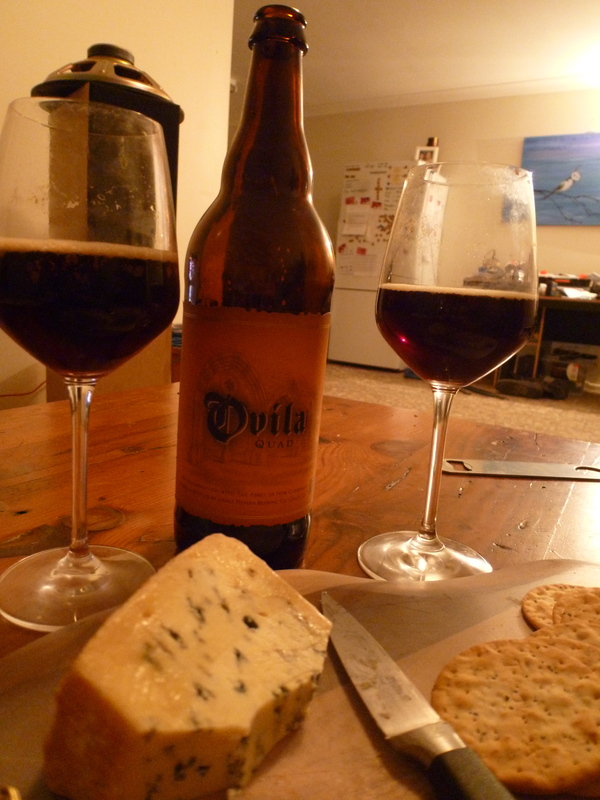 The contrasting flavours of medium bodied, port-like sweetness from the Ovila against the creamy aggressive blue cheese was absolutely lovely. If you’re in Perth, the best place to try get a hold of this beer would be the International Beer Shop. Thank You to Andy Mac for the gift of a bottle of Ovila Quad! Not a bad way to end a meal!